We have Steampunk and Gothic Necklaces in every style, from chokers to long chains. The cunning serpent knew his target well when he infiltrated the garden of biblical lore. A Rose for Eve Pendant embodies a sinister gift freely offered, the picture of foul poison veiled by dark, mysterious beauty. Card games require a mix of luck and skill that quickly separates the card sharps from the novices. The Aces Up Necklace includes four different card suit. This gothic necklace display the four classic suits. This AC/CD pendant is from the 2014 adaptation of the iconic AC/DC logo, from the sleeve of their album ''Rock Or Bust''. The Anguistralobe Pendant features a working miniature of the 18th century tool used to measure the path of destiny among heavenly bodies. The gothic instrument employs a dark design tailored to the crueler twists of fate. The Angel Ring Pendant displays the symbols of the seven planetary angels in bright green enamel over the surface of the black loop. The reverse side is inscribed with their respective names, planets, and days. The Anguis Aeternus Pendant depicts the fierce form of a wyvern as it curls around a shimmering vitrail Swarovski crystal. The dragon pendant displays the creature as it loops around the colorful, faceted crystal of life. Connected with the elements, dragons have long been symbolic of power. The Aqua Dragon Necklace symbolizes not only power, but majesty, beauty, and grace that can be found within the element that gives life - water. The old ways can be kept alive and well, if you so desire, by keeping their symbols near and dear to your heart. This Amon Ram Necklace allows you to wear an ancient Egyptian god's symbol as you would any great accessory. According to ancient myths, the union of a king and a succubus yielded one of the seven princes of hell, the demon of lust. The Asmodeus Pendant depicts his symbol, that of a horned demon skull with great gothic style. Viking protection talisman for a true lord. This Amber Dragon Thorhammer Pendant is a classic, ornate and highly intricate pagan amulet of power and protection, fit for a high ranking Saxon or Viking leader/warlord. The Celts Cross Pendant is a symbol of early Christianity in classical Celtic carved knot work. This Gothic knotwork cross pendant is cast and hand-made in fine English pewter and comes on a nickel-free chain. Intelligent tricksters, ravens seem to follow wherever the darker elements of the world thrive. The Black Raven Pendant displays one of these gothic birds as it scans the ground below for potential prey or mischief. Known from legend and myth, the powerful hammer of the Norse god Thor as depicted in the Bindrune Hammer Pendant offers a classic protection amulet. This Mjolnir pendant displays a detailed design with authentic styling. The Catafalque Necklace displays funerary grace as it hangs on its black ribbon. The gothic necklace displays a skull between foliate designs that supports an oval onyx drop stone surrounded by additional leaf details. The Blood Moon Pendant creates a scene from one of the most dangerous nights of the lunar calendar. This full moon pendant features a vivid red crystal accent surrounded by a colony of vampire bats in flight. This tortured heart appears in the Black Romance Necklace. It is a simple piece that is symbolic of the fine line that separates love from hate. It is far too easy to cross that line and become locked in a black romance. If a good knight is awarded a medal for his valorous acts, then what is an evil knight given for his dastardly deeds? Perhaps it is something like the Black Knights Cross Pendant in support of his nefariousness. Behold the skull of an emerging nightmare. The Birth Of A Demon Pendant depicts only the skull of a fledgling demon as it emerges into the world. This sinister skull glares maliciously as it hangs from a pair of chains. This three-pronged fork of the demons signifies the wearers intent to cast darkness over all that lies before them. Worn and wicked, few can deny the devilish appeal that is a part of the Black Trinity Trident Pendant. Do not let the succulent design of this Black Cherry Skull Pendant fool you, as these dark fruits are anything but tasty! While not good eats, this pendant is certainly a good treat, though, as it can do wonders for your style. Our Caw at the Moon Pendant has a glowing lunar disk that dramatically silhouettes an already black and portentous raven. It is perched above the earth in its otherworldly attentiveness. The perfection of life force and the seat of the deepest desires of modern man. This brass-hinged locket has a magnetic catch, glass rods, and etched brass components. This Corvus Machina Necklace comes on a chain. The Dragons Claw Pendant showcases the clawed foot of a mystical dragon that carefully grips a smooth smoked topaz crystal orb. This rich brown accent stone looks great against the metallic gleam of the detailed dragon foot. The Cult of Isis Pendant features a translucent red enameled solar disk, horned and enthroned, of the great Egyptian and universal goddess. Wear this protective gothic amulet to call upon the power of this deity. The Dantes Hex Pendant replicates the eye-catching style of a medieval pentagram, surrounded by an outer circle. This detailed symbol of protection would be familiar to a 13th century literary genius such as Dante. The Draconkreuz Pendant depicts the symbol of an obscure, mystic medieval order for holders of arcane and ancient magical powers. This cross pendant features bright red Swarovski crystal accents at the end of each bar. A dragon can be a powerful ally, but is it safe to trust one that has a heart of diamond? Consider carefully before answering, and you might gain a powerful ally in the dragon of the Diamond Heart Necklace. The Demimondaines Necklace with the world at their feet, the hedonistic 'bright young things' of the Deco Era dazzle with style comes with 9 Swarovski which are square and round cut crystals with black enamelled panels. A 1920s art deco style, rectilinear aesthetic construct of the final resting place of the master designer of the era. This Coco Casket Jewel Necklace features a striking triangular-cut genuine Swarovski crystal drop and a smokey enamel tomb with embedded skeleton. Never forget that beautiful things can be deadly as well. At first glance, this Deaths Head Butterfly Choker is nothing more than a colorful and beautiful butterfly. But a second look reveals the subtle death mask design. There might not be any flesh and blood attached to this bone, but do not underestimate how ferocious a dragon truly is, even in a skeletal state. This dragon skull is impeccably detailed, featuring impressive ridges and decorations that run along its eyes and its maw. Independently, the Chaos Star and the Pentagram are both exceptional and powerful symbols, each with their own meaning. Together, though, they become so much more, making this Chaosagram Pendant a great personal emblem. An alluring and impressive symbol of the night can be found in this lovely Eventide Bat Necklace. More than a dozen little bats make up this pendant, creating an attractive accessory that shows them all flying. Originally a replacement for the astrolabe, this quadrant measures more mysterious properties. Occultists used tools like the Enlightenment Astral Dragon Quadrant Locket for divination using the movement of the astral dragon through the stars. A metal axe-man should never be without his weapon of choice! Now you can totally rock your style in a literal sense, by adding this Flaming V Guitar Pendant to your style. This way, everyone will know that you rock. A memorial to the lives taken in battle, the Death Ingot Necklace displays a rectangular pendant showing the alchemical caput mortuum symbol at the top, followed by black teardrops and a medieval sword beneath. Offering elegance with a pure heart of rainbow-spangled white crystal set among a foliate frame, this necklace displays Victorian charm with a gothic twist. The Victorian Crystal Heart Necklace makes a fantastic accessory. Gleaming with iridescent colors like the Northern Lights, this necklace shares the beauty of the tears that fall to earth from the heavenly eyes of God. The Empyrian Eye Tears From Heaven Pendant displays intricate designs around its crystals. The mighty power of the Doge of Venice came to an end as the nobleman slipped from life. Modeled on the rich regalia of office, the Dogeressa Choker offers one last token of forlorn devotion to the bereaved Renaissance lady of the Palace. Is your style of love filled with angel wings and harp music, or do you like to be just a little wicked? The Devil Heart Pendant dangle bright red enamel hearts with silvery, pointed horns and twining, forked tails. Are you ready to face the hell-rider? This Death Valley Skull and Spanner bones Necklace is the gothic emblem of gear-heads and grease-monkeys everywhere, bringing death-metal and mechanical style to any attire with ease. This Lightning bolt logo design based-on David Bowie's early 1970s aesthetic. An antiqued English pewter pendant on 21'' trace chain. Our GMT Quantum Displacer Control Pendant "an essential piece of equipment for any self-respecting, Victorian cyber-junkie, and the means by which they would calibrate the necessary compensation for entropic shift in matter when enabling transposition. In homage to the master of the macabre, Edgar Allen Poe, the Nevermore Cross Pendant is inscribed over its horizontal bar with the infamous answer of the raven from his celebrated supernatural narrative poem, The Raven. In todays age of disbelief and logic, it can be hard for a creature of the night to make themselves known. The Kiss of the Night Vampire Bat Pendant makes a stunning yet discreet token of your alternative, nightly tendencies. The Mjollnir Pendant references the name of Thors magical hammer, appearing on a split chain. This Gothic pendant is handmade in fine English pewter and does not need regular polishing to maintain its gorgeous appearance. One of the most iconic creatures of the night, bats appear to be the natural companions of other spooky beings such as vampires and werewolves. 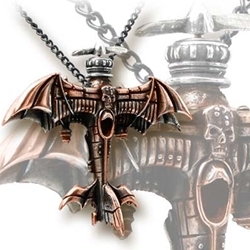 The Gothic Bat Pendant showcases one of these nocturnal creatures as it flies. The design of the Medieval Pentacle Pendant originated during the Middle Ages, serving as one of the most common sigils to ward off demonic powers. The pentagram pendant features two metallic tones and a blue cabochon crystal. The Nosferatus Rest Pendant displays this iconic figure encapsulated within a smoke glazed pewter coffin. This Prince of the Night retreats daily to this deathly box before the first rays of the sun creep over the horizon. The Lost Soul Pendant features the pitiful, tortured remains of a hapless nobody. The skeleton hangs by its wrists in a cruel pose, left to moulder away rather than given a proper burial to send its soul to rest. The Illuminati Cross Pendant draws its design from one of the most mysterious groups of legend. This gothic cross pendant represents Rome, where the angels of Bernini steer the sacred path of light through the altars of science. The La Mort De Coeur Pendant symbolizes the tragic death of the heart following betrayal by the object of its affections. This gothic heart pendant melds the profile of a detailed skull into the side of the heart shape. The Heart of Darkness vampire Necklace features a black enameled heart with red blood and on a 23 inch black rosary bead necklace. Turn to the dark side with this captivating heart of darkness bead necklace. The Gothic Ankh Pendant offers a vampire hybrid of the Egyptian symbol for eternal life and the stylistic form of High Gothic art. The ankh necklace displays a round black accent crystal just below the loop of the crux ansata. The Foundrymans Ring Cross Necklace is a powerful symbol of an old faith embodied and embedded in the gears and steel of an ironworkers soul. Words that speak of the powerful faith and belief that are embedded in this talisman. The raven was an animal sacred to Odin, and by carving this rune onto a skull, the sigil is empowered by Odins own magic. This Helm of Awe Ravenskull Pendant offers a twist on the traditional design of Viking jewelry. You will never need another blade again so long as you wear the Kaspars Axe Pendant around your neck! This wicked pendant takes the shape of an impressive-looking axe that would be perfect for cutting a swathe through the hordes. Now you can tie the knot with a touch of romantic darkness! Inspired by the popular phrase, as well as with the ages old handfasting ceremony, this Gothic Matrimony Necklace pairs elegant design with a delicate bow-tie styled knot. The heart locket is richly adorned with Swarovski crystals and scrollwork. A central skull and lock design complements the draped key dropper accent, while the pendant is worn via elegant satin ribbon. A well-known pearl of wisdom claims that every rose has its thorn, or that beautiful things can indeed by painful or deadly. The Love Imprisoned Pendant embodies that notion, surrounding a tender heart with barbed wire. One of the most potent and widely used amulets in the world, the cross has long been a symbol of devotion and religious belief. The Gothic Devotion Cross Pendant takes the shape of a treflee, also called the Apostles Cross. A symbol of eternal life, the ankh in this pendant melds subtly with the background heart and prominent amethystine gem. The Herz Leben Pendant displays the distinctive cross-with-handle shape with gothic details. Dripping from the wings of love, this cold heart has frozen diamond-hard and sharp as ice. The Frozen Heart Pendant symbolizes the chilled heart of one who has experienced broken affections with no remorse or attempt of atonement. This pendant design, found in the 19th century among the ruins of Coustaussa castle in Languedoc, is impossibly circled by a gold ring. The Maryam Theotokos Ring Cross Pendant offers a striking piece of jewelry for your look. A tangled confusion of love, devotion, and mourning combine in the design of this striking necklace. Representing an impassioned and devastating loss, the Funeral for a Paramour Necklace depicts a red satin coffin pad among twining rose vines. Will you be seduced by unfettered access to the gates of the Underworld, or can you manage to resist temptation? The Key to Hades Pendant displays a pendant that depicts an old-fashioned key formed out of a demonic skull and bones. Shrouded in mystery, could this be the key to life itself? With the Key to the Secret Garden Necklace, you can unlock secrets hidden behind impenetrable walls, leading to secret liaisons, magical experiences, and even romance - that is, if you can find the door. From the malevolent depths of the fathomless ocean, a monstrous, crystallized soul of darkness begins to take shape. The Heart of Cthulhu Pendant showcases the extremities of a sea creature holding an iridescent heart. A sword through the heart serves as a token of a love conquered and forever held within the heart of the beloved. The Love is King Necklace features a sword pendant that fits through the center of the pewter scrollwork heart. Do you take sugar with your absinthe? A huge and confident statement of opulence and a taste for exotic pleasures. This La Belle Esprit Necklace is a gloriously ornate, late Art Nouveau style, wormwood-winged fairy. A dedication to love, life, or just ink? The Forever Inked Necklace features Swarovski crystal motor coils that power the tattoo machine held in a skeletal grasp. This gothic necklace inscribes a message of eternity on the wearer. The place of the skull, and the site of the crucifixion depicted by a deferentially chained cross and black crystal mark the scene of a deep and passionate suffering, worn to express emotional desolation as only a true goth knows how. If you want to rock, you will need a mic, some vocals, and tunes. With this Lets Rock Pendant, you will have a critical part of that equation around your neck as a tribute to good tunes and good times. Who needs a hole in the head? Not to worry, no violence committed. You can just adorn yourself with this wicked and wonderful little Hole in the Head Pendant! Usually this is a fatal experience, but not with this accessory. London Lady Heirloom Choker-Black or White. Choice of S/M (measures 15" with a 2" Velcro extension) or M/L (measures 17" with a 2" Velcro extension).